November 2, 2018 November 2, 2018 Lee Ann L.
I apologize for being late with this post. I was out and about early and late this morning in an attempt to get some Macro pictures. Without further ado, here’s my latest submission. 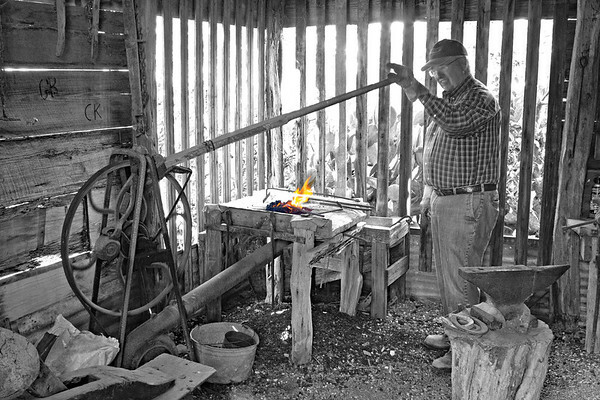 This was a demonstration at an extremely old blacksmith shop that was moved to and restored at the Heritage Village portion of the Texas Agricultural Education and Heritage Center. The man is moving the lever up and down turning the wheel causing air to travel up the pipe to fan the flames from underneath the tiny forge. My Photoshop (element) skills are limited. I created a duplicate layer, converted it to black and white Newspaper format and then used the eraser to make the flames shine through. Nice! I really like the black and white background to showcase the fire.